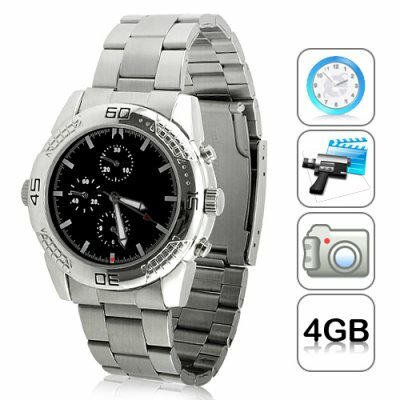 Successfully Added Watch - 30FPS Camcorder DVR Watch (Stainless Steel) to your Shopping Cart. Introducing our newest watch for 2010.
in style with this virtually undetectable watch. 30 FPS for smooth motion capture, 192 kb/s audio recording for high quality audio, and an extremely small pinhole lens for ing on people without suspect. This gadget has everything you need to capture high quality undercover videos, and without anybody knowing the better! With the easy one button operation you will always be ready to capture high quality hidden videos within a moments notice, any time any place. Simply press the RECORD button once to record, and then press it again to stop and save. The video files are then saved to the internal 4GB memory in user friendly .AVI files for easy playback on your computer. This attractive stainless steel watch is built using the newest high grade components and is fully backed by our 12 month guarantee. If you are looking for a strong, stylish, and undetectable watch that records beautiful videos, then the I47 is the perfect watch for you. Order the I47 in bulk now while supplies last and we will express ship your order by tomorrow. The I47 is available only from the leaders in wholesale electronics, Chinavasion! Video automatically saves after 50 minutes, then begins recording again. Does this watch also record audio? YES? on 2010-09-23 17:18:48 Good item! It's a vary good item.